I just uploaded the new version to the Android Market. Even though I worked on this feature very hard over the last two months the new authentication using the Account API from Android 2.0 didn't make it. It gets even worse. I will not try again until there is a new Android version, or documentation for Google's implementation of this feature or the standard apps like Contacts and Calendar are using it without relying on closed source bits. Oh, and Google Apps accounts should also work. Sorry, it was not for a lack of trying, but I could have only enabled something that would only work on Android 2.1 devices, only for Google accounts and even then I am not sure if a mass rollout wouldn't have surfaced even more issues. It doesn't seem to be ready for prime time yet. Keep your fingers crossed for better luck in the future. And please don't try to persuade me otherwise. I know this topic is important too many, but I could have implemented so many other features instead and have to cut my, actually our, losses here. 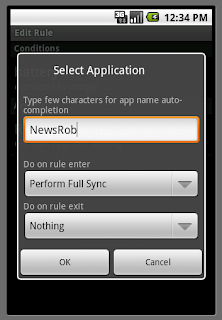 You can now trigger a NewsRob sync from within Setting Profiles. Use SettingProfiles for example to schedule a NewsRob sync at a certain time, e.g. every morning at 6am, or when you plugin your phone. SettingProfiles is available in the Android Market for $2.95, which I think is a great price, but to top it all off the functionality described above is available in the free version of Setting Profiles also. As requested (http://newsrob.uservoice.com/forums/35624-general/suggestions/409292-simple-widget-with-unread-count?ref=title) this release brings you the first widget. 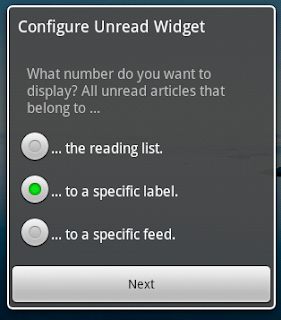 For the current release this widget offers an unread count and opens the article list based on the defined criteria. Please checkout http://newsrob.uservoice.com for other feature suggestions for widgets and vote for them or enter your own. 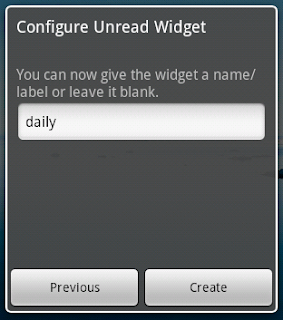 If you would like to discuss possible other widgets, please come to the list: http://bit.ly/nr_list. For now this is an exclusive feature of the paid NewsRob Pro version, but at least in parts it will likely merge into the free version in one of the next releases. Thanks to Alexander Blom of Gmail Unread Count fame for helping me with the shortcut look of the widget. All errors are mine. This is a mandatory update. Unrelated to the new Android authentication mechanism from above the Google Reader team also changed the way they expect authentication to happen on a service level. This release contains the necessary changes and Google will likely stop supporting the old way soon. 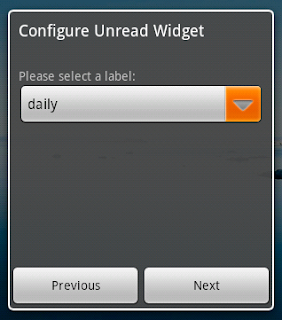 I was wondering if it would be possible to allow me to add an RSS feed to my reader? I hate having to go home to add a new feed when I find something I want to follow. For the time being it might be a workaround to add the new feed using the google reader mobile web interface? if we are in china, how are we supposed to buy your software? what do you mean? That there is no Android Market with paid apps in China? Maybe I am alone in this but the version does not retrieve anything for me. Also, other updates have kept my cache and once I updated, all articles in the "read" pile are now gone. sorry to hear that. I am not aware of any changes in that area though. Couple of things upfront though. In the free version read articles are deleted during each sync if you set Synchronization Type to "Keep & Sync: Unread Only". You can set it to "...: All Articles", if you don't like that. Actually that is the default. The Pro version will also keep some read articles if they are starred, shared or notes. The best thing to find out what happens on your phone is a log. Could you please state the symptoms you are seeing on the mailing list, install the free "Log Collector" app from the Android Market, hit Refresh in NewsRob so that it generates the relevant Log entries and then launch Log Collector and send the log file not to the mailing list, but to me: mariano.kamp@gmail.com. I am in the US and tried to buy the app on my motorola droid and it would not let me buy the pro version. I can buy everything else but it will not let me buy from you. can you check into the problem for me. I would like to purchase this product. Also an email to contact you on would be nice in stead of this blog comment. I don't see an order from a Chuck at the moment. You can also contact me using Google Checkout. I don't have my email adress conveniently in the app anymore, because I then don't find the time to do any development anymore. I am serious, I tried. I try to filter most things to http://bit.ly/nr_list and can tell you that I answer every mail there. Still I can understand why you are not happy about that, but I hope you see my point oo. Contact me by email with your full name and I'll check it out. Ah, sorry, you already contact me. I wasn't aware of the Chuck <-> Charles thing. I actually was under the impression that it works until I read two hours ago in the Market comments that it is not working for you on your N1. I have an N1 myself and will check it out. Stay tuned. I just tried that and it works for me on the N1. Could it be that notifications don't seem to work for you at all and not just the sound? The usual confusion about notifications is that you need to enable them on a per-feed basis too. The rationale behind it is that every sync will get some new articles. Notifying once every hour would be more annoying than helpful. On the other side though it might be noteworthy when on a few dedicated blogs something new comes up. To enable it go to an article of a relevant feed and select "Manage Feed" from the context menu. In the following dialog you can enable notfications for that feed. That is true, BUGabundo, there is no explicit support, but if you handle it right you can fallback to using the associated email address with Google Reader and so everything works fine. With the new Auth I (and two other devs with whom I was working on that) have not found how to keep that functionality (yet). ps. If you don't do it "right" you won't see an error message, but just no subscriptions. I'm a bit confused on how to save feeds that I want stored on my SD card so I can keep it. How does this work and what does it save? When I sync it does it take, say, all 50 feeds (my preset limit) and save them or is there a way to specific feeds. Kraze, I am not 100% sure if I get your question. So let me give you some answer and you tell me if this covers your question. The article offline content is saved on the SD card, the articles' meta data are stored in a database in your phone memory. If you set Settings/Sync/Sync Type to "Keep and Sync: All Articles" and the capacity in Settings/Local Cache/Reading List to 500 articles, then after each sync NewsRob will contain the 500 most recent articles you have in your Google Reader account. This is independent of their read status. When new articles come in then the oldest articles are deleted to make room for the new articles. When you change the Sync Setting to "Keep And Sync: Unread Articles Only" then during each sync the read articles are removed. Also during each sync NewsRob tries to fill up older unread articles until the capacity you configured is met or no more unread articles are left in your Google Reader account. That's basically it. If you have the Pro version you can also set how many starred articles, shared articles and notes are to be synced and kept. Yes that helps a lot. I guess the only thing I'm wondering is if there's a permanent way to save a feed so that as new feeds come in past your limit you set, it doesn't delete the feed you wanted to keep if its the oldest feed. Basically, can you 'save' a feed permanantly on your sd card (possibly to view months later 'offline') without worrying it being deleted as new feeds come in. Sorry if this is confusing for my lack of understanding. What I call an article is a single posting in a feed, whereby a feed contains lots of articles from the same publisher. So in my terminology your question is how to keep an article? In the pro version you can star the article and it won't be deleted if you also set the setting to keep starred articles (up to 200). In the free version you cannot do that. Don't(!) worry to ask again if I left something unclear. Great app! Was looking for a nice Google reader app and I have definitely found it! Two feature requests I have... a setting for changing the number of articles in a feed to the number of UNREAD articles, and a setting to resize images to fit to screen width. Not sure if I get this first thing, but maybe it's Settings/Sync/Sync Type=Keep & Sync Unread Only? When i press buy pro button, the market returns The requested item could not be found. what's wrong? hard to say. Are you in a country with paid apps? It's in the next version and although I could still change my mind I intend to make it a feature that is available in the lite version. I use NewsRob Pro and its got some bugs that are really annoying. Could we get the following fixed? - The left and right arrows visible in posts to take you to the next post can obscure post content. For example using Reddit's feed the left arrow routinely obscured the link to the actual story. Please either put them at the bottom of the screen or make them content aware or somethin. - Stories just randomly disappear. You'll tap an item to read it and it will just get marked read and disappear. This is very annoying. - The inline browser is really bad. Please just have links open in the default browser. Make this an option if you want. Over the months I've been using the software these problems have really started to annoy me. Thanks. Sorry to hear that. Glad that you voiced the issues you have instead of turning your back. (a) You can turn off the arrows in the settings: Settings/UI/Article Detail View/Hovering Buttons Nav. I don't want to move them to the bottom. It looks weird, in particular when you also have the hovering zoom controls. Also they are in the middle of the screen, so that it is easier to touch them, even when they are not shown. That way you don't need to wait for them to show up, but just touch the right part of the screen and the buttons will recognize your touch before they are diaplayed. (b) What phone are you using? A Nexus One? Go to the settings and uncheck Settings/UI/Article List/Swipe To Mark Read. Anyway long press on a link in the browser and you get the option to open the link with the browser that you defined as the default. Hope that helps. Let me know if that is not the case. Great App, I've happily bought your product. What's be best way to reduce the Data footprint? Currently I have about 1000 articles in my reader and I've set all local cache setting to max and it downloads full web pages. I guess by reducing the number of articles will lower the data usage? I've answered my previous question as the app size is now down to 2Mb total. Is there a way to cache contents from sites that require a login? For example I have an account with http://www.newscientist.com but their articles feed http://www.newscientist.com/feed/magazine is behind a paywall. I can browse these articles once I login but it would be lovely if the app could use my credentials to access the page and cache it for me. The memory usage you see depends on two things. One is the web cache from the embedded browser, which is regularly and aggressively cleaned. In fact it is cleaned every time you leave the article detail view with the "BACK" button. So if you really have a low memory situation you could force the cleanup (or stop the buildup) of the Web View cache by leaving the article detail view from time to time. But in normal operations that is not necessary. The other thing is indeed depending on the number of articles. The articles themselves are usually stored on the SD card, but the metadata are stored in a database that is kept in the phone memory. When you reduce the number of articles you might also want to check the Settings/Sync/Sync Type option. Setting "Unread only" is the more efficient choice for most people. No, there is currently no way to cache content from sites that need a login. You can make a suggestion at http://newsrob.uservoice.com though. I´ve installed Android 2.1 on my HTC Magic and altought I´ve selected option Enable Notifications, I can´t get icon with unread articles on status bar. When I open NewsRob I can see all the unread articles so it´s updating himself but notification icon doesn´t appear. Only appears first time NewsRob is executed, just after install. I´ve tested NR3.7.9.4 and got same issue. You need to enable notifications on a per-feed basis. You can enable that in the "Manage Feed" menu, which is accessible from an article's context menu. I´m feelin stupid right now! XD You are totally right, that was the problem. Best regards and thanks for your good work. No, it's no bug. Manage Feed only works on feeds so far. There might be a "Manage Label" in the future, see the link from above. 1.- I'm subscribed in more than 30 news with more than 500 feeds/day but NEWSROB displays only 26 sites of 30. Am I doing something wrong? 2.- Under Synch Interval: would be great to enable 1-5 minutes interval. 3.- What can I do to enhance NEWSROB ? Would you be interested in translating to Catalonian and Spanish ? THX for the best Google Reader. regarding 3. Currently I am not looking into internationalization, but thanks for offering help. And also thanks for your praise. Regarding 2. This would not be efficient and would run your battery down to fast. If you want to continue discussing it move the discussion to the mailing list. Ok? Regardin 1. Hard to say so far. You're subscribed to 30 feeds? What is your configuration in Settings/Sync/Sync Type? I've been looking around with all the config system many times and tried all of them but still having the same problem. If you have set it to "all articles" it will "only" show you the most recent x articles and their feeds. So you only see feeds where you have articles on your device and your filter settings match (hide/show read articles). So if you set x to 500 then you will also only see the feeds of those 500 articles. If you set the parameter I mentioned above to "unread only" then all the read articles are removed during the next sync and only unread articles stay on the phone. NewsRob will then try to fetch older unread articles until the defined capacity (x, 500) is reached. I recently downloaded your app on my HTC Hero, but I think I'm having a problem with it. It seems to sync, but not all of the blogs I have subscribed to. I have subscribed to 36, but only 17 show up on my Hero. Am I missing some sort of step that I need to do? Or is there something wrong with the app? If you could please email me & let me know, I'd really appreciate it! Also it *may* be that you want to set Settings/Sync/Sync Type to "Unread Only". before I jump on the "pro" wagon a quick question: Will the widget also work on the HTC Sense user interface? I am on a HTC Legend, and this would be an particular great feature that makes me switch to "pro". from a functional point of view I can answer that with a yes. I don't know enough though to say if this will look like you expect. What I can tell you for sure is that there is no special treatment for the Sense UI. Hi, I am running Pro on a Desire. Every post is doubled and also once it finishes downloading new articles, it resets my phone. Any help would be appreciated. Duplicate articles - Do the duplicates change their read state together? Do you use bundles? With the same name as a label? Reset: I've never heard that before. 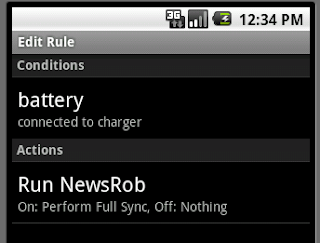 Do you use notifications in NewsRob?